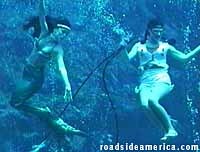 The 1997 Weeki Wachee theme show, Pocahontas Meets Little Mermaid, delivered the kind of underwater orchestration one would expect from an institution as well-versed as Weeki Wachee. Children were particularly mesmerized, with greasy little hands and faces pressed against the theater glass. Our fascination centered on the amount of singing dialog the mermaids had to lipsynch, while performing underwater ballet and gulping from air hoses. FROG: Like my Aunt Phibian used to say "That's a lot of bull....FROG!" 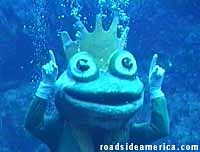 CHORUS: He's the Frog of Weeki Wachee! FROG: I won't dance on your Hibachi! CHORUS: The Frog of Weeki Wachee! FROG: You were expecting Liberace? CHORUS: The Frog of Weeki Wacheeeee Springs! SHE WILL SHOW HER HOW...TO BE AN IN-DEE-UN! To make it rain from clear blue sky! And your moccasins will make a little Indian dance! EVERYONE: Yi Yi Yi! Yi Yi Yi! You send smoke signals that your friends far away can see! And of course you have a horse, or you never get nowhere! That's what it takes to be an In-dee-unn! If you teach her how to be a mermaid too. LIT-TULL MERMAID NOW... TEACHING PO-CA-HONTAS! SHE WILL SHOW HER HOW... TO BE A MERMAID TOO! Listen close to what I say to you. That's how you can be a Mermaid too! Move it up and down just like a whale. You'll be singing like a mermaid in the deep blue sea! And so on, for a total of 30 minutes. The show ended with the entire cast gyrating to the Weeki Wachee theme song, "We've Got the World by the Tail." Weeki Wachee Springs State Park. On the west side of US Hwy 19/Commercial Way just south of Cortez Blvd. $13 park entrance fee. The mermaid show is free. Gas Station Dinosaur, Spring Hill, FL - 1 mi. Pepto-Bismol Pink Dinosaur, Spring Hill, FL - 4 mi. Ice Cream Cone Building, Spring Hill, FL - 4 mi. Bubbles the Manatee, Homosassa, FL - 20 mi. Stories, reports and tips on tourist attractions and odd sights in Florida.